My husband, oldest son, and I practically toppled over backwards trying to tilt our heads back far enough to catch a glimpse of the awe inspiring Royal Gorge Bridge. Stretching out so magnificently across the morning sunlight above us, it almost appeared plugged-in to the two steep rock wall outlets mounted on opposite sides of the canyon. These sheer walls dropped powerfully downward for more than a thousand feet, to channel the Arkansas River into the swift flowing, white-water rapids we were about ready to mount and ride in a raft. This being a first-time experience for all of us, I couldn’t help but wonder as I spotted our guide, if I could trust the hand that was about to lead us into uncharted waters? Even so…each of us climbed aboard the Royal Raft; fashionably clad in rented wet suits, splash jackets, and protective head gear. To the outside world, we looked ready-and-waiting for this new adventure. Sitting secure in the raft between our two guides and one other couple, an uncomfortable feeling welled up inside of me. A feeling suggesting those swirling waters meant something entirely different to each one of us that day. For my Husband, Jim…this was just ‘The River.’ Something he had always wanted to do. For me…this was ‘The River? ?’ I didn’t even know how to swim, so what was I thinking? For my son, Mike…this was ‘The River!! !’ A teenage adrenaline high which offered him the thrill of a lifetime! Each of our reasons for being there were different. In spite of these differences, we sat like little kids on the first day of school; hanging onto every word of instruction being given to us by our guides, Chachi and LJ. “Each of YOU will play an intricate part in this white-water adventure,” LJ emphasized, pushing the Royal Raft out into calmer waters. As he did so, Chachi handed out paddles to each of us. Immediately, all eyes bulged beyond socket capacity. “Me, paddle?” Bu…but I thought I was coming along for the ride.” our facial expressions cried out in mortified silence. Clearly, we were the Royal Rookies in this matter! Gripping the paddle as tightly as the fear which now gripped me, all I could think of was the logo I’d just seen on the front of a sweatshirt back in the gift shop. It pictured a skull-and-crossbones labeled with these haunting words, “PADDLE OR DIE! !” Somehow, that all made more sense to me now. Not wishing to die that day, I opted for my only other choice. Paddle! Struggling to refocus in the moment, I could hear Chachi and LJ explaining how to maneuver the raft using different methods of paddling. “Right Turn!…Left Turn!…Back Paddle! LJ shouted , demonstrating each method with his own paddle in the water. “High Side!… Wrap Side! … ROCK! … and Stop!” Chachi chimed in. With every requirement, our guides integrated into this crash course in Paddling 101, it became more evident they knew the river well. These men understood the treachery of the waters we were about to face because they’d been there before. With respect and a keen sense of safety, they reinforced each paddle command hurled at us as being a sort of lifeline. A lifeline thrown at us for the express purpose of pulling us through the churning waters to safety. Approaching our first stretch of white water, we braced ourselves for impact; each of us taking a deep breath, struggling to hear Chachi shouting above the roaring river. “Remember…listen carefully, paddle in sync…and most of all…TRUST ME!” he hollered. With those words, we plunged head-first into the angry waters. I could feel the sting of the river’s icy fingers slapping me square in the face. The early spring flood waters still carried a merciless winter chill. Every muscle in my body tensed! Though everything in me wanted to scream out, “NO!” to this experience, somehow I managed to hold onto my paddle using my own newly discovered version of a death-grip. The river’s relentless fingers again wrapped themselves around my head like a blindfold. I couldn’t see anything! Through the confusion, I could still hear the paddle commands being given by both of our guides. Knowing this to be a cry of immediate danger, almost without thinking, we reached out with our paddles, pushing ourselves away from its jagged edges and forcing the raft back in the center of the rolling waters. At the bottom of this run, my heart sang a whole new song. A song whose words were written in the permanent ink derived from a strange and wonderful mixture of adrenaline and apprehension. It didn’t take any of us long to realize our raft was the only one of three rafts that hadn’t flipped over and fallen prey to the river’s insatiable appetite. Our own Royal Raft, for a short time, functioned as a Lifeboat! Our paddles-in-flight; we maneuvered through the currents to rescue a few VERY grateful friends still struggling in the water to try and keep from becoming the river’s first meal of the day! Each of us paddled for our lives that morning. Whatever Chachi and LJ told us to do…we did it without question. We found strength we didn’t even know we possessed. 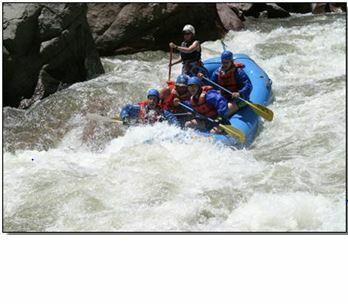 Our first run through these white waters fostered a whole new respect for the river. But, even more than this, we quickly learned we could trust the hand guiding us through these treacherous waters. Before the day ended, I experienced a broad spectrum of emotions. Excitement laced with apprehension; as I stepped into uncharted waters with my family. Fear of the consequences of having done just that! Doubt I had the strength to paddle my way through the difficult waters surrounding me…without drowning. Just leave it to God to take my excitement, fear, and doubt; and show me how to turn them into trust! As the sun dropped low in the evening sky, Jim, Mike, and I climbed out of the Royal Raft; planting our feet firmly on dry ground. Life never felt so-o-o good! We waved good-bye to Chachi and LJ. Turning to go, I heard what I considered to be the last paddle command of the day. “Stop!” a Voice said softly in my ear. “Yes,” I thought to myself, smiling as I stopped. This Voice was not audible to the world, but I heard the Message loud and clear. You see…even the tiniest Whispers of God can be heard over the raging river waters of this world. God spoke one word to me…but, He whispered it three different ways. “Life.” “Life? ?” … or “Life!!! The waters of “Life” are precious in any form but, why just climb into the raft, sit, and hold the paddle? Learn not to just paddle, but to paddle well! At times, we all feel pulled under and blinded by the churning waters of “Life? ?” trying to drown us. Remember…just listen for the command, grip the paddle a little tighter, and find the strength you didn’t know you had. Wholly trust in the Hand that’s guiding you. For it is He who can be found on the other end of it. Waiting…wanting to help you discover the truest meaning of “Life!! !” at its fullest.